Wes buys a carwash in LA’s Koreatown and gets a young Korean wife he’s never met as part of the bargain. The catch? Her five previous husbands were murdered before the honeymoon. Now Wes has a ring on his finger and a target on his back…and is caught in the middle of a centuries-old blood feud that won’t end until he’s either dead or the last husband standing. 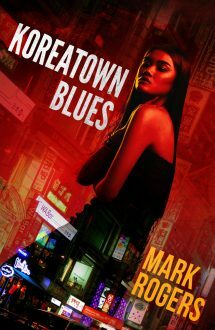 "Koreatown Blues" is a refreshing, lively novel that holds out hope that sometimes, if you're a decent guy, people will help you find original solutions to some very grim problems. Mark Rogers delivers a genuinely fresh take on a modern crime novel. It’s fast and witty, with an eye for character and pacing that reads like early Charlie Huston. Bruce DeSilva, the Edgar Award-winning author of the Liam Mulligan crime novels. An Entertaining, fast-paced first novel with an unexpected ending. A mystery that revitalizes the L.A. noir tradition from the inside out...It’s a page-turner of a pulp told with a literary sensibility and a social conscience.